This page is about the ceremonial county. For the historic subdivision of Yorkshire, see North Riding of Yorkshire. 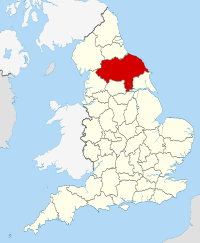 For other uses, see North Yorkshire (disambiguation). The largest settlement in the administrative county is Harrogate, the second largest is Scarborough, while in the ceremonial county, the largest is York. The largest urban area within the ceremonial county is the Middlesbrough built-up area sub-division of Teesside. 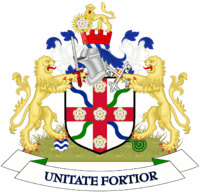 The ceremonial county area, including the unitary authorities, borders East Riding of Yorkshire, South Yorkshire, West Yorkshire, Lancashire, Cumbria and County Durham. The geology of North Yorkshire is closely reflected in its landscape. 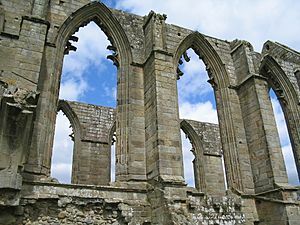 Within the county are the North York Moors and most of the Yorkshire Dales; two of eleven areas of countryside within England and Wales to be officially designated as national parks. 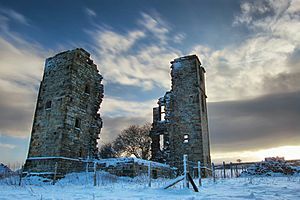 Between the North York Moors in the east and the Pennine Hills in the west lie the Vales of Mowbray and York. The Tees Lowlands lie to the north of the North York Moors and the Vale of Pickering lies to the south. Its eastern border is the North sea coast. The highest point is Whernside, on the Cumbrian border, at 736 metres (2,415 ft). The two major rivers in the county are the River Swale and the River Ure. The Swale and the Ure form the River Ouse which flows through York and into the Humber estuary. The River Tees forms part of the border between North Yorkshire and County Durham and flows from upper Teesdale to Middlesbrough and Stockton and to the coast. 7 Acomb 22,215 2011 York Town Forms part of York Built up area. Collection of wards. Settlements in italics lie only within the ceremonial county, not the administrative county.. The main road through the county is the north-south A1/A1(M) which has gradually been upgraded to motorway status since the early 1990s. The only other motorways within the county are the short A66(M) near Darlington and a small stretch of the M62 motorway close to Eggborough. The other nationally maintained trunk routes are the A168/A19, A64, the A66 and A174. The East Coast Main Line (ECML) bisects the county stopping at Northallerton, Thirsk and York. Passenger services on the ECML within the county are operated by Virgin Trains East Coast, TransPennine Express and Grand Central. TransPennine Express run services on the York to Scarborough Line and the Northallerton–Eaglescliffe Line (for Middlesbrough) that both branch off the ECML. North Yorkshire Facts for Kids. Kiddle Encyclopedia.